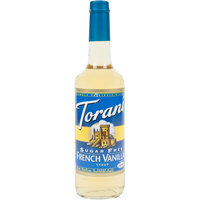 Bring all new flavors to your specialty drink menu with this Torani sugar free French vanilla flavoring syrup! It's sweetened with Splenda brand sweetener, which offers the taste of real sugar without the calories. This tempting flavor will complement your beverages without overpowering them or being too sweet, while the user-friendly bottle will be convenient for your busy baristas to use. Torani flavoring syrups are specially formulated to resist curdling in milk and to hold up well under heat, making them the perfect choice for espresso-based drinks, brewed coffee or tea, and more. Use this flavor for frappes, iced coffees, smoothies, and even baking! This syrup is delicious in teas and coffees. The french vanilla flavor is very similar to the "sugared" version. As a bonus it does not have a weird after taste like some other sugar free products. We use the Sugar Free French Vanilla every morning in our coffee. It mixes well with the other sugar free Torani flavors to make them a little less strong and to make more complex tasting flavors. Delicious! The sugar free flavors from Torani are really great. I don’t notice any aftertaste often associated with “sugar free”. Definitely stock your sugar free from Torani! The Sugar free French vanilla is my personal “go to” syrup. I've bought these in the grocery store many times but I love the variety and size of the ones on here. its almost quadruple the small ones in the store for just a couple more dollars. Absolutely great taste and value and I will continue to purchase these. Great sugar free french vanilla flavoring syrup. Add freely to coffee, tea, pancake batter, cookie dough, greek yogurt, muffins, whipped butter and cream. Use anywhere that you would add vanilla flavor. Great Sugar Free flavor to have on the shelf!! Many of our customers use this in their coffees and say they can hardly tell it’s sugar free! This is the slowest selling of the sugar free vanilla syrups. It lends a unique vanilla profile. I can not say it is worse as I love it...just that you need to pair it appropriately. We use this Torani Sugar Free French Vanilla Flavoring Syrup very often at my cafe and it adds the perfect touch to our coffee! I would definitely recommend this product. WebstaurantStore always has fast shipping and is consistently reliable! I like to order the sugar free syrups to add to my coffee or hot chocolate. I find the Torani syrups in general to be pretty good. This French vanilla flavor is sweet and mild. A smooth tasting syrup. Fast shipping and easy ordering. I love the selection of sugar free syrup flavors. This is the best variety I've found. Good flavor and value. Sugar free is a plus and customers like it. Will buy again if we need to restock. Shipping was a little slow though. The sugar free French vanilla flavoring syrup is so good and the no sugar syrup is great for diabetics. A great syrup for making excellent coffee style drinks in seconds. I've been using the Sugar free vanilla torani for years at home. I love adding it to my coffee and smoothies. Webstaurant has the best price that I've found and a great selection of prices. Good flavor for coffee drinks that does not leave that sugar free after taste that a lot of things tend to leave. Good price when you buy in bulk. Makes the best french vanilla coffee. So convenient just pour and enjoy. And to top it off Webstaurantstore has the best pricing!!! Win win! for my morning coffee. We use this in many of our sugar-free lattes and frappes. Our customers love it and tell us it tastes exactly like the full sugar version! A popular flavour in our household. We usually use this in our latte that we make with our espresso machine at home. Highly recommend this! A nice sugar free vanilla flavoring syrup that is great for adding a splash of French Vanilla flavoring to my coffee. It is a great quality syrup that tastes great. Another decent flavoring syrup form Torani. It was a good vanilla flavored syrup, it just did not differ very much in taste from regular vanilla like the non sugar free syrups do. The taste is still very rich and makes great coffees. I would just suggest sticking with the regular vanilla sugar free syrup. We are all big fans of this flavor here in my coffee shop. We try to remove sugar as much as possible and this has been a big help. Vanilla seems to be the most popular sugar free variety of espresso beverages that we sell. The flavor is sweet but it tastes pretty good. Absolutely delicious flavor again from Torani. i can honestly say that they hit the mark every single time. I have never tasted a bad flavor! The perfect addition to my morning coffee. This has a great subtle flavor that does not overpower my coffee but adds just the perfect amount of sweet. I''ve tried different flavors of this product. They weren't my favorites but that could just be my taste. More than the serving size is needed but be careful about adding to much because that is worse than the not enough. It's edible but I've had better. This is the best flavoring syrup I've tried! We use the syrup in our coffee and love the flavor. The sugar free is just as good as the sugared version. I've tried all kinds of syrups for coffee and by far Torani has won out for flavor! Another great Torani syrup. The french vanilla flavor is true, and it perks up anything you add it to. We use a lot of torani sugar free syrups at our house, and although we bought them for our protein shakes, they go into about everything these days. I ordered this one for my husband, who is a french vanilla snob, and I really like it too. You guys do some great syrup. This French Vanilla syrup is very delicious. I add it to smoothies, coffees, lattes, baking etc.. It is one of my many go tos from Torani's Sugar Free line of Syrups. I go through fazes. It's French Vanilla, Vanilla, Salted Carmel! I have been completely sugar free for exactly 1 year, and this is the only thing that I use that has Splenda. Everything else is natural sweetness like stevia. But I definitely cures that "sweet tooth" when I feel it coming on! Great tasting sugar free syrup. We use for all types of coffee flavored drinks including blended frappes drinks. I would highly recommend this product for coffee shops and cafes. Hard to believe its sugar free. Torani flavoring syrup is a great tasting product that does not break the bank. This is one of many we offer. This is a great alternative to French Vanilla when customers can't have the real thing. They all love it. The Torani syrup line is awesome! Perfect choice for hot or iced coffee. Use to flavor cookies for banana pudding. Dont have to worry about the added sugar or calories. Love it! This sugar free vanilla syrup is great in coffee to add flavor and sweetness without the calories and carbs of regular sugar. Torani syrups are a must have for anyone looking to cut down on sugar in their diet. I started using this is coffee and quickly realized it had so much more potential. I now use it in so many of my recipes. This product is another customer favorite. It works great in all of our hot beverages and iced coffees. This is a must own syrup for your beverage program. Torani Sugar Free French Vanilla Coffee Flavoring Syrup is a great way to sweeten your coffee. It is a guilt free way to enjoy your beverages.